A slightly weakened Hurricane Irene is making its way toward the East Coast of the United States, packing maximum sustained winds of 110 miles per hour and promising a wet and windy weekend for residents along the Mid-Atlantic coast up into New England. Governors from at least seven states declared states of emergency in advance of the storm, which was about 375 miles south-southwest of Cape Hatteras, N.C., at 8 a.m., according to the National Hurricane Center. 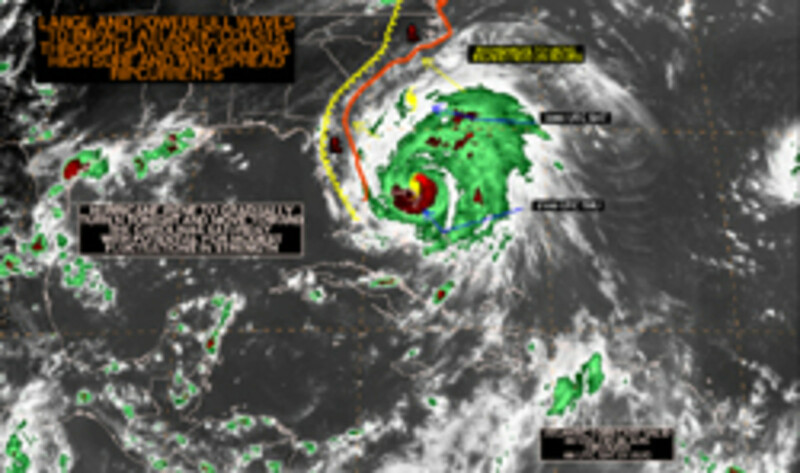 A hurricane warning is in effect for Grand Bahama and the Abaco Islands and Little River Inlet, N.C., north to Sandy Hook, N.J. A hurricane watch is in effect from Sandy Hook to the mouth of the Merrimack River in Massachusetts, including New York City, Long Island, Block Island, Boston, Martha’s Vineyard and Nantucket. Interests elsewhere in New England are urged to monitor the storm’s progress. A hurricane warning means hurricane conditions are expected in the warning area within 36 hours. A hurricane watch means that hurricane conditions are possible in the watch area within 48 hours. The core of Irene will pass well off the coast of northeastern Florida today and approach the coast of North Carolina tonight, according to the hurricane center. The hurricane is forecast to move near or over the Mid-Atlantic coast Saturday night. Irene is now a Category 2 storm, but could intensify today, the hurricane center said. Potential damage from the storm could be in the billions, some experts say. “One of my greatest nightmares was having a major hurricane go up the whole Northeast coast,” Max Mayfield, former chief of the National Hurricane Center, told ABC News, saying it will lead to damage in the billions. “This is going to have an impact on the United States economy,” he added. Beachgoers enjoying one of the last weekends of the summer are being urged, and in some cases ordered, to evacuate beaches along the East Coast. As many as 200,000 tourists and residents were expected to evacuate North Carolina in advance of the storm. State officials ordered evacuations in Hyde County for residents and visitors, as well as for visitors in Dare and Currituck counties. Delaware Gov. Jack Markell ordered a mandatory evacuation of non-residents along the state’s coastal areas and strongly urged residents with the ability to leave beach communities to do so as soon as possible. New Jersey Gov. Chris Christie called on people to voluntarily leave the shore and temporarily suspended tolls on all parts of the Garden State Parkway and the Atlantic City Expressway. Up and down the coast, marina personnel were working overtime to haul boats out of the water. “The phones have been ringing off the hook for people who want to get on the list to have their boats pulled,” Erik Tornquist, at Navesink Marina in Sea Bright, N.J., told the Asbury Park Press. Tornquist and fellow worker Tim Mckiernan said they had a list of 50 boats waiting to be pulled out of the water as a precaution because of the pending hurricane. They had already pulled 17 boats out of the water by early Thursday afternoon and had more boats to pull before the day ended. At Wright Island Marina in New Rochelle, N.Y., operations manager Leroy Marriott looked at a list of four boats at least 45 feet long that he planned to take out of the water.